Avalokiteśvara or Padmapani (/ˌʌvəloʊkɪˈteɪʃvərə/ UV-əl-oh-kih-TAY-shvər-ə; Sanskrit: अवलोकितेश्वर) is a bodhisattva who embodies the compassion of all Buddhas. This bodhisattva is variably depicted, described and portrayed in different cultures as either male or female. In Tibet, he is known as Chenrezik, and in Cambodia as "អវលោកិតេស្វរៈ". In Chinese Buddhism, Avalokiteśvara has evolved into the somewhat different female figure Guanyin. In Japan this figure is known as Kanzeon or Kannon. In Nepal Mandal this figure is known as Jana Baha Dyah, Karunamaya, Seto Machindranath. The name Avalokiteśvara combines the verbal prefix ava "down", lokita, a past participle of the verb lok "to notice, behold, observe", here used in an active sense; and finally īśvara, "lord", "ruler", "sovereign" or "master". In accordance with sandhi (Sanskrit rules of sound combination), a+īśvara becomes eśvara. Combined, the parts mean "lord who gazes down (at the world)". The word loka ("world") is absent from the name, but the phrase is implied. It does appear in the Cambodian form of the name, Lokesvarak. The earliest translation of the name into Chinese by authors such as Xuanzang was as Guānzìzài (Chinese: 觀自在), not the form used in East Asian Buddhism today, Guanyin (Chinese: 觀音). It was initially thought that this was due to a lack of fluency, as Guanzizai indicates the original Sanskrit form was Avalokitasvara, "who looks down upon sound" (i.e., the cries of sentient beings who need help). It is now understood that was the original form, and is also the origin of Guanyin "Perceiving sound, cries". This translation was favored by the tendency of some Chinese translators, notably Kumārajīva, to use the variant 觀世音 Guānshìyīn "who perceives the world's lamentations"—wherein lok was read as simultaneously meaning both "to look" and "world" (Sanskrit loka; Chinese: 世; pinyin: shì). The original form Avalokitasvara appears in Sanskrit fragments of the fifth century. This earlier Sanskrit name was supplanted by the form containing the ending -īśvara "lord"; but Avalokiteśvara does not occur in Sanskrit before the seventh century. 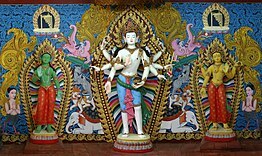 In Sanskrit, Avalokiteśvara is also referred to as Padmapāni ("Holder of the Lotus") or Lokeśvara ("Lord of the World"). In Tibetan, Avalokiteśvara is Chenrézik, (Tibetan: སྤྱན་རས་གཟིགས་) and is said to emanate as the Dalai Lama the Karmapa and other high lamas. An etymology of the Tibetan name Chenrézik is spyan "eye", ras "continuity" and gzig "to look". This gives the meaning of one who always looks upon all beings (with the eye of compassion). According to the Kāraṇḍavyūha Sūtra, the sun and moon are said to be born from Avalokiteśvara's eyes, Shiva from his brow, Brahma from his shoulders, Narayana from his heart, Sarasvati from his teeth, the winds from his mouth, the earth from his feet, and the sky from his stomach. In this text and others, such as the Longer Sukhavativyuha Sutra, Avalokiteśvara is an attendant of Amitabha. When the Chinese monk Faxian traveled to Mathura in India around 400 CE, he wrote about monks presenting offerings to Avalokiteśvara. When Xuanzang traveled to India in the 7th century, he provided eyewitness accounts of Avalokiteśvara statues being venerated by devotees from all walks of life: kings, to monks, to laypeople. In Chinese Buddhism and East Asia, Tangmi practices for the 18-armed form of Avalokiteśvara called Cundī are very popular. These practices have their basis in the early Indian Vajrayana: her origins lie with a yakshini cult in Bengal and Orissa, and her name in Sanskrit "connotes a prostitute or other woman of low caste but specifically denotes a prominent local ogress ... whose divinised form becomes the subject of an important Buddhist cult starting in the eighth century". The popularity of Cundī is attested by the three extant translations of the Cundī Dhāraṇī Sūtra from Sanskrit to Chinese, made from the end of the seventh century to the beginning of the eighth century. In late imperial China, these early esoteric traditions still thrived in Buddhist communities. Robert Gimello has also observed that in these communities, the esoteric practices of Cundī were extremely popular among both the populace and the elite. 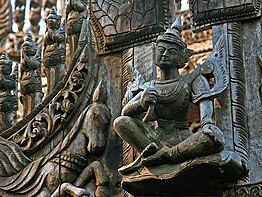 Avalokiteśvara is popularly worshiped in Myanmar, where he is called Lokanat or lokabyuharnat, and Thailand, where he is called Lokesvara. The bodhisattva goes by many other names. In Indochina and Thailand, he is Lokesvara, "The Lord of the World." In Tibet he is Chenrezig, also spelled Spyan-ras gzigs, "With a Pitying Look." In China, the bodhisattva takes a female form and is called Guanyin (also spelled Quanyin, Kwan Yin, Kuanyin or Kwun Yum), "Hearing the Sounds of the World." In Japan, Guanyin is Kannon or Kanzeon; in Korea, Gwan-eum; in Vietnam, Quan Am. Avalokiteśvara is worshipped as Nātha in Sri Lanka. Tamil Buddhist tradition developed in Chola literature, such as in Buddamitra's Virasoliyam , states that the Vedic sage Agastya learnt Tamil from Avalokiteśvara. The earlier Chinese traveler Xuanzang recorded a temple dedicated to Avalokitesvara in the South Indian Mount Potalaka, a Sanskritzation of Pothigai, where Tamil Hindu tradition places Agastya having learnt the Tamil language from Shiva. Avalokitesvara worship gained popularity with the growth of the Abhayagiri vihāra's Tamraparniyan Mahayana sect. Western scholars have not reached a consensus on the origin of the reverence for Avalokiteśvara. Some have suggested that Avalokiteśvara, along with many other supernatural beings in Buddhism, was a borrowing or absorption by Mahayana Buddhism of one or more deities from Hinduism, in particular Shiva or Vishnu. This seems to be based on the name Avalokiteśvara. On the basis of study of Buddhist scriptures, ancient Tamil literary sources, as well as field survey, the Japanese scholar Shu Hikosaka proposes the hypothesis that, the ancient mount Potalaka, the residence of Avalokiteśvara described in the Gaṇḍavyūha Sūtra and Xuanzang’s Great Tang Records on the Western Regions, is the real mountain Pothigai in Ambasamudram, Tirunelveli, Tamil Nadu. 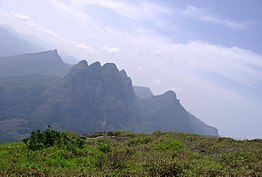 Shu also says that mount Potalaka has been a sacred place for the people of South India from time immemorial. It is the traditional residence of Siddhar Agastya, at Agastya Mala. With the spread of Buddhism in the region beginning at the time of the great king Aśoka in the third century BCE, it became a holy place also for Buddhists, who gradually became dominant as a number of their hermits settled there. The local people, though, mainly remained followers of the Hindu religion. The mixed Hindu-Buddhist cult culminated in the formation of the figure of Avalokiteśvara. Mahāyāna Buddhism relates Avalokiteśvara to the six-syllable mantra oṃ maṇi padme hūṃ. In Tibetan Buddhism, due to his association with this mantra, one form of Avalokiteśvara is called Ṣaḍākṣarī "Lord of the Six Syllables" in Sanskrit. Recitation of this mantra while using prayer beads is the most popular religious practice in Tibetan Buddhism. The connection between this famous mantra and Avalokiteśvara is documented for the first time in the Kāraṇḍavyūhasūtra. This text is dated to around the late 4th century CE to the early 5th century CE. In this sūtra, a bodhisattva is told by the Buddha that recitation of this mantra while focusing on the sound can lead to the attainment of eight hundred samādhis. The Kāraṇḍavyūha Sūtra also features the first appearance of the dhāraṇī of Cundī, which occurs at the end of the sūtra text. After the bodhisattva finally attains samādhi with the mantra "oṃ maṇipadme hūṃ", he is able to observe 77 koṭīs of fully enlightened buddhas replying to him in one voice with the Cundī Dhāraṇī: namaḥ saptānāṃ samyaksaṃbuddha koṭīnāṃ tadyathā, oṃ cale cule cunde svāhā. One prominent Buddhist story tells of Avalokiteśvara vowing never to rest until he had freed all sentient beings from saṃsāra. Despite strenuous effort, he realizes that many unhappy beings were yet to be saved. After struggling to comprehend the needs of so many, his head splits into eleven pieces. Amitābha, seeing his plight, gives him eleven heads with which to hear the cries of the suffering. Upon hearing these cries and comprehending them, Avalokiteśvara tries to reach out to all those who needed aid, but found that his two arms shattered into pieces. Once more, Amitābha comes to his aid and invests him with a thousand arms with which to aid the suffering multitudes. Avalokiteśvara is an important deity in Tibetan Buddhism. He is regarded in the Vajrayana teachings as a Buddha. 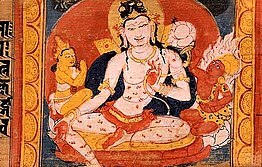 In Tibetan Buddhism, Tãrã came into existence from a single tear shed by Avalokiteśvara. When the tear fell to the ground it created a lake, and a lotus opening in the lake revealed Tara. In another version of this story, Tara emerges from the heart of Avalokiteśvara. In either version, it is Avalokiteśvara's outpouring of compassion which manifests Tãrã as a being. Magnificent clay images of Amoghpasha Lokesvara flanked by Arya Tara and Bhrikuti Tara enshrined at the side wing of Vasuccha Shil Mahavihar, Guita Bahi, Patan : This set of images is popular in traditional monasteries of Kathmandu Valley, Nepal. Avalokiteśvara sandstone statue, late 7th century CE. Eight-armed Avalokiteśvara, ca. 12th-13th century (Bàyon). The Walters Art Museum. The bronze torso statue of Padmapani, 8th century CE Srivijayan art, Chaiya District, Surat Thani Province, Southern Thailand. The Privy Seal of King Ananda Mahidol of Thailand show a picture of a Bodhisattva, based on a Srivijayan sculpture of Avalokiteśvara Padmapani which was found at Chaiya District, Surat Thani Province. The stone head of Avalokiteśvara, discovered in Aceh. 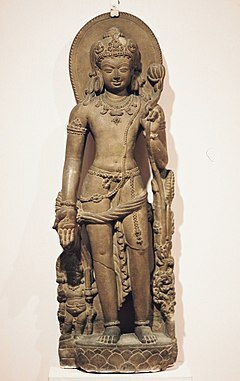 Srivijaya, estimated 9th century. ^ "Avalokitesvara". Random House Webster's Unabridged Dictionary. ^ a b Leighton, Taigen Dan (1998). Bodhisattva Archetypes: Classic Buddhist Guides to Awakening and Their Modern Expression. New York: Penguin Arkana. pp. 158–205. ISBN 0140195564. OCLC 37211178. ^ Studholme p. 52-54, 57. ^ Lokesh Chandra (1984). "The Origin of Avalokitesvara" (PDF). Indologica Taurinensia. International Association of Sanskrit Studies. XIII (1985-1986): 189–190. Archived from the original (PDF) on June 6, 2014. Retrieved 26 July 2014. ^ Mironov, N. D. (1927). "Buddhist Miscellanea". Journal of the Royal Asiatic Society of Great Britain and Ireland. 2: 241–252. JSTOR 25221116. ^ a b Studholme p. 52-57. ^ Studholme p. 30-31, 37-52. ^ "From Birth to Exile". The Office of His Holiness the Dalai Lama. Archived from the original on 20 October 2007. Retrieved 2007-10-17. ^ Martin, Michele (2003). "His Holiness the 17th Gyalwa Karmapa". Music in the Sky: The Life, Art, and Teachings of the 17th Karmapa. Karma Triyana Dharmachakra. Archived from the original on 14 October 2007. Retrieved 2007-10-17. ^ "Glossary". Dhagpo Kundreul Ling. Archived from the original on 2007-08-08. Retrieved 2007-10-17. ^ Bokar Rinpoche (1991). Chenrezig Lord of Love - Principles and Methods of Deity Meditation. San Francisco, California: Clearpoint Press. p. 15. ISBN 0-9630371-0-2. ^ Studholme, Alexander (2002). The Origins of Om Manipadme Hum: A Study of the Karandavyuha Sutra. State University of New York Press. pp. 39-40. ^ Studholme, Alexander (2002). The Origins of Om Manipadme Hum: A Study of the Karandavyuha Sutra. State University of New York Press. pp. 49-50. ^ Lopez 2013, p. 204. ^ "Art & Archaeology - Sri Lanka - Bodhisattva Avalokiteshvara". ^ Läänemets, Märt (2006). "Bodhisattva Avalokiteśvara in the Gandavyuha Sutra". Chung-Hwa Buddhist Studies 10, 295-339. Retrieved 2009-09-12. ^ "Saptakoṭibuddhamātṛ Cundī Dhāraṇī Sūtra". Lapis Lazuli Texts. Retrieved 24 July 2013. ^ Venerable Shangpa Rinpoche. "Arya Avalokitesvara and the Six Syllable Mantra". Dhagpo Kagyu Ling. Archived from the original on 27 September 2007. Retrieved 2007-10-17. ^ Dampa Sonam Gyaltsen (1996). The Clear Mirror: A Traditional Account of Tibet's Golden Age. Shambhala. p. 21. ISBN 978-1-55939-932-6. ^ Shaw, Miranda (2006). Buddhist Goddesses of India. Princeton University Press. p. 307. ISBN 0-691-12758-1. ^ Bokar Tulku Rinpoche (1991). Chenrezig, Lord of Love: Principles and Methods of Deity Meditation. ClearPoint Press. ISBN 978-0-9630371-0-7. Tsugunari, Kubo; Akira (tr. ), Yuyama (2007). The Lotus Sutra (PDF) (Revised 2nd ed.). Berkeley, Calif.: Numata Center for Buddhist Translation and Research. ISBN 978-1-886439-39-9. Archived from the original (PDF) on 2015-07-02.